Favorite Find from Global Pet Expo! It’s been a little over a month since I attended the Global Pet Expo in Orlando and I’m just now finishing up the long process of going through about 200 pounds of literature! I promised to tell you all about the cool things I discovered at the show and today I’m sharing with you about my absolute favorite product from the show. There are many that I love but first is first. 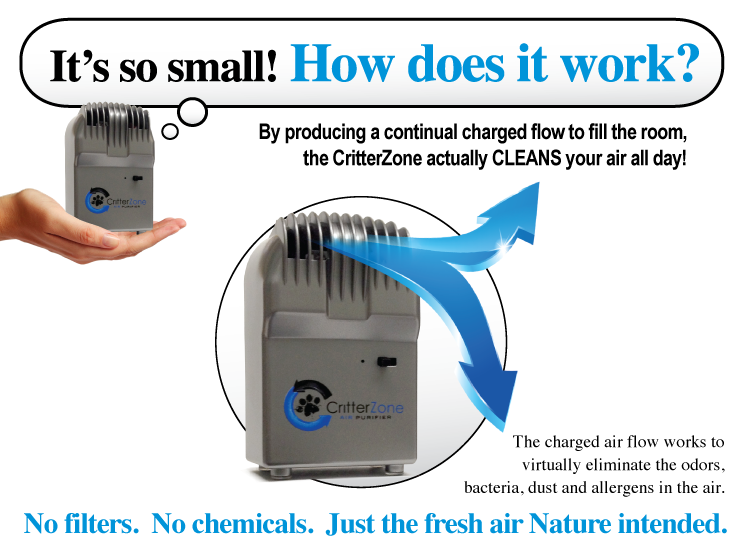 It is the CritterZone Air Naturalizer. I took one home the first night and it did exactly what they said it would do! Actually, it worked even better than expected. What does it do you ask? It cleans the air and eliminates odor. Having a family of four Yorkies qualifies me to be a tough customer when it comes to cleaning the air. 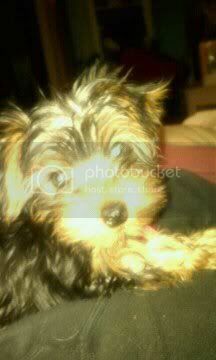 I know Yorkies are small and don’t shed and really don’t stink very often, however, they do have accidents at times. There were all kinds of products at the show to remove odor. This was the best! At the show I met a pleasant woman who demonstrated it for me. She took a cloth and squirted some very heavy ammonia on it and let me smell it…I got a little too close (or enthusiastic) and it just about knocked me over! Then she took the small hand size machine and held it up to the cloth. Within about 30 seconds she had me smell the cloth again and….NOTHING! Not a trace of ammonia! Needless to say I took one home that night. Upon returning from a 10 hour day, 2 of the dogs were locked up comfortably in our bathroom. After a whole day in there it smelled like….well just like “DOG”. No accidents or anything, just that stuffy doggie smell. I ran to my bags of goodies and picked out my CritterZone, plugged it in and told my hubby, “We’ll see if this really works!” About an hour and a half later I went to check it out…No doggie odor! The room gave off a very clean fresh smell. The air felt so oxygen rich, fresh and clean! I was surprised on how well this tiny little box worked. They say it only takes 2 or 3 to totally clean the air in a 1800 sq foot house. Here’s is why I like CritterZone Air Naturalizer so much. It actually cleans the air instead of putting chemical sprays in the air. It doesn’t need a filter to change! It comes with a cord or direct plug in the wall…no batteries! It also has a car adapter available for stinky cars! It removes pollutants from air such as bacteria, mold, Salmonella, Listeria +! It offers virtual germ control for your air, surfaces and fabrics! Compared to electronic Hepa and Air filters, it is cheaper and much quieter! It takes up space the size of your coffee mug! It uses a process called Bi-Polar Ionization & Plasma Conversion to clean air. It actually PREVENTS germ & mold growth! Cleaning is very easy and not very often! Breathing clean air can extend live expectancy! You don’t need a pet to use one! I could go on and on about the CritterZone but you really just need to try it yourself. They have a 30 day money back guarantee. Wants a fresh smelling car! Has someone sick at home! Realtors for Listings with odors! Likes to breathe fresh, health clean air! The CritterZone makes a fantastic gift! It’s the gift that keeps on giving. You can give it as a gift for healthy air, without insulting them about the odor that they are probably used to! We travel a lot with our dogs so that means we stay at hotels that allow pets. Sometimes we will get a non smoking room that clearly had a smoker or smells just plain musty. It is a great little gadget to take along to purify the room. I recommend getting the one with the removable cord instead of direct wall plug in. That way if you ever want to use it in the car or boat you can get the plug that fits into your lighter. You can also move it to a stubborn rug or furniture odor spot. I offer my readers a $10 discount off the retail price of each unit. Order online and enter “4TheDogs” in the promo code area and it will apply your discount. It’s also available in the 4thedogs.com store but you need to go thru the direct link above to save the $10. Let me know how much you love yours when you get it! Stay tuned for my next blog about cool products I discovered at the Expo and our store at 4TheDogs.com!